Yesterday I finally got around to shooting some photos for my website homepage. I knew exactly the type of photo that I wanted to take, and I had been trying to get this setup with the correct lighting for a few months! I had actually set up my desk and taken some shots 2 times before, but I realized that the amount of lighting in my apartment just wasn't what I wanted. So Steve brought his truck over (thanks Steve! 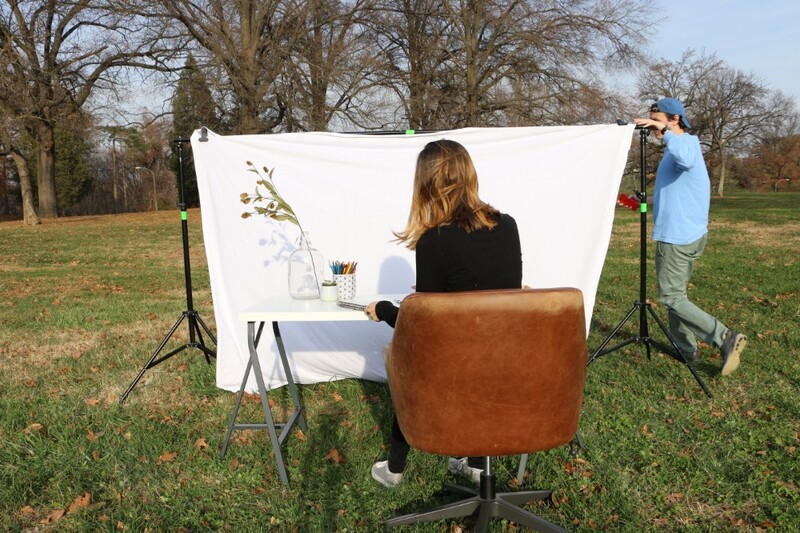 ), and we loaded all of the necessary items onto it and drove it over to Forest Park to shoot in the direct sunlight. The thing about outdoor photoshoots is that you have to wait until the weather is perfect. I had been planning this a few weeks ago, but the weather had been dreary on the days we tried to go. Luckily yesterday wasn't too cold, and the sun was out with only a few clouds. Forest Park is really close to my apartment, so it was convenient to get to. We parked near the World's Fair Pavilion in a grassy area that was somewhat remote so we wouldn't have other people in the shot. I brought my backdrop stands, a blanket for the backdrop, my chair, a few items on the desk, my camera and tripod, and the desk. The great thing about the desk I brought was that it's only made up of the super light tabletop, and two stands to just rest the top on. I use that tabletop for shooting products since the white is perfect for that. For my daily work, I use my long wooden desk, but for photoshoots, the white one is necessary. It took about 15 minutes to set everything up, then we started shooting. Luckily I just set my camera to 10-second delay so I could check the photos in between shots, and Steve didn't have to mess with it. We ran into problems with the wind right away. I didn't realize how windy it was going to be, so I didn't pack any sandbags for the backdrop stands. They kept falling over in the wind, sometimes on top of the table setup. And my hair was super wind-blown, which ruined some of the otherwise great photos.